Death Guard Players. Your color scheme inspiration? Subject: Death Guard Players. Your color scheme inspiration? I just have to wonder. How many players of the Death Guard get inspiration from actual wounds and malignancies? Subject: Re:Death Guard Players. Your color scheme inspiration? I’m doing a Nautical themed traitor chapter so I used sea green and blue as my colour scheme. I want them to look like they’ve been rusting under water for centuries. My personal group is a bunch of bitter, outcast loyalists, where the theme is more about dry radioactive wastes and broken cities they've crushed under relentless bio/chem warfare. I've never been a fan of the wet 'goopy' look of a lot of death guard. I wanted something that looked more like honorable warriors fallen to the decay of ages from being in space for thousands of years. So i went with a mostly bone colored look and trim in pastel green as a nod to the standard deathguard colors. There's many kinds of decay and water logged isn't the only kind. I went for a mix of the white color scheme in the codex and 30k death guard. They are basically death guard who were swallowed by the warp right after the siege of terra and re-emerged only recently. I'd heard there would be a clatter, then perhaps a hiss, but that's not what it's like. We'd all been told that these things lurked in vents and crevices, that they could sneak up on a man no matter how alert, but that just wasn't what happened. We saw them coming, well, we heard them first, an ear-splitting boom as they accelerated across the plain. They must have been 2 miles away when we heard the crack, but we barely had time to lift our weapons before they were on us and then... past us. Running faster than I could follow. They didn't attack, didn't even try and it was then, as the whole platoon stared after them that a dread crept through me and I turned to see that which they had been running from. 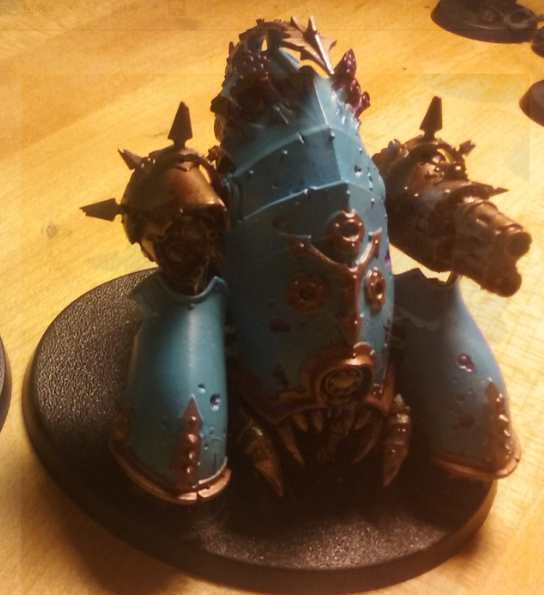 I went with the Weeping Legion color scheme. I loved the scheme since I first saw it in the 4th edition CSM codex. I love the contrast of the white cream and the brown gunk oozing out of the holes. I can't say i was inspired by actual wounds, no. maybe i should be! but i will probably not. honestly my main goal when i started painting my death guard was "not green". So i went with a kind of light blue and what i hoped would be rusty orange. i'm not all that good but i do like the color scheme in general. There's some amazing work here in this thread though, i love it. I don't have a Death Guard army yet, but when I do, the colour scheme will be based around browns and yellows and eschew greens altogether. My inspiration will be literal s#!t and vomit. I have mine painted up in word bearers colors, mainly because I mix in a lot of my 30k relics in my lists. "Pain is an illusion of the senses, fear an illusion of the mind, beyond these only death waits as silent judge o'er all." 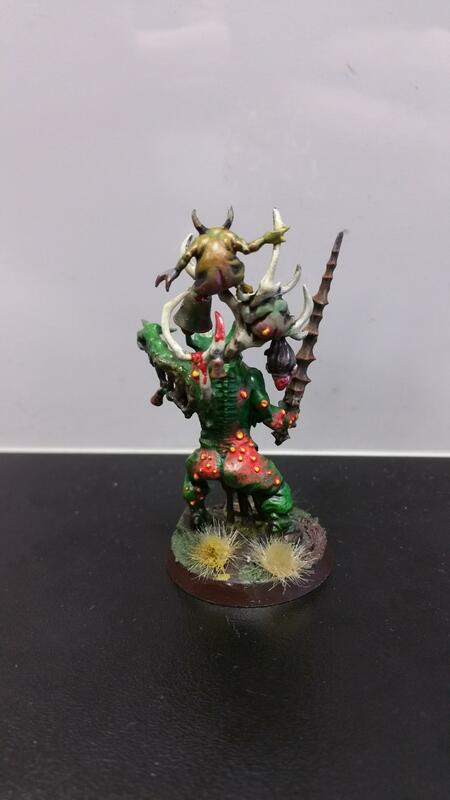 I'm not a great painter, so I actually used pictures of myself with pretty bad acne as a teenager as a reference for how to do the boils on my Daemons of Nurgle (and then exaggerated it a fair bit). My Death Guard themselves are just very very rusty. My plague marines (CSM Renegades army) are simply painted in an homage to the classic Death Guard...why reinvent a great scheme? Keep it classic, and keep it classy. I haven't started painting them yet, but when I do, I want to give them a reddish-purple hue, like that of dried and/or infected blood. I may also do some black ones to represent black diarrhea (a sign of serious internal bleeding) and maybe some pale yellow to represent excessive bile and jaundice. If I did Death Guard, that is what I would do as well. If anything, the white being grungy adds to the whole disgusting factor. I once did white armour with pink trim, casings and helmets. It looked really great but I wished I had left the helmets white. There some pics on my profile of them still.